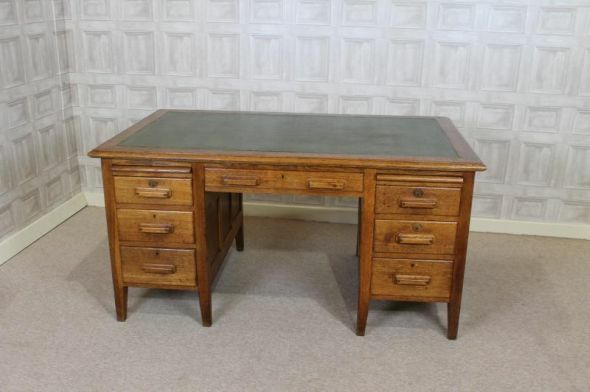 A superb quality 1930s solid oak office desk. Featuring a traditional twin pedestal design, the desk comes with a green leatherette style writing surface. This does show a small amount of wear and tear. As you can see from the selection of photographs, this oak office desk is of outstanding quality and made from solid oak. It has hand dove tailed joints, and is a truly useful piece of furniture for any office interior. In excellent condition for its age, this oak office desk will complement a range of existing oak furniture.